Need a winning brownie recipe? Try our Macaroon Brownies. 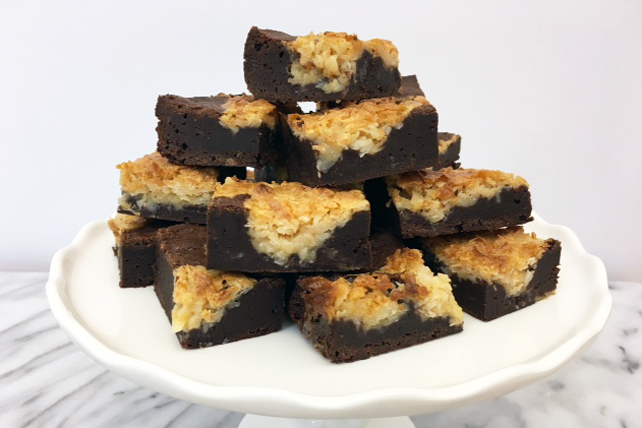 These chewy, intensely chocolate brownies, topped with a coconut macaroon mixture, are guaranteed to be a crowd pleaser. Microwave chocolate and butter in large microwaveable bowl on HIGH 3 min. or until butter is melted, stirring after 2 min. Stir until chocolate is completely melted and mixture is well blended. Add sugar; mix well. Blend in eggs and vanilla. Stir in flour. Pour into 13x9-inch pan sprayed with cooking spray. Combine sweetened condensed milk and coconut; drop in large spoonfuls over brownie batter in pan. Bake 30 min. or until toothpick inserted in centre comes out with fudgy crumbs. (Do not overbake.) Cool completely. Line empty baking pan with foil, with ends of foil extending over sides of pan. Use to bake brownie as directed. Cool brownies, then use foil handles to remove brownie from pan before cutting to serve. Cool baked brownie completely. Refrigerate 1 hour. Use serrated knife to cut brownie into bars, wiping blade of knife between cuts to ensure clean cuts.